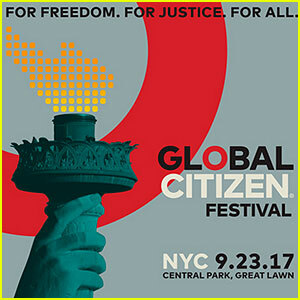 Concert goers at yesterday's Global Citizen Festival in New York's Central Park made it abundantly clear where they stand on Donald Trump's lambasting of NFL players going to their knee during the playing of the National Anthem. After taking the stage, Stevie Wonder and his son Kwame Morris went to one knee and them both knees in support of the NFL players. Wonder said "Tonight, I’m taking a knee for America, but not just one knee, I’m taking both knees. Both knees in prayer for our planet, our future, our leaders of the world and our globe." The action drew a huge cheer from the crowd. Wonder's set, which was longer than most other artists throughout the day, included special appearances by his son, Kwame, daughter, Aisha, for whom he wrote Isn't She Lovely, and singer/producer Pharrell Williams.